Seattle based Farecast, a service that predicts and guarantees airline prices, has expanded its reach outside of the United States, with international coverage in key markets. Farecast, which launched in May 2006, tries to predict flight price changes for consumers so they know whether to buy now or wait. In late 2006 they added guarantees, effectively allowing consumers to buy insurance policies against price increases in the event they decide to wait. More recently, Farecast added hotel bookings as well. The site now offers predictions for over 200 markets between U.S. cities and Europe, Mexico, the Caribbean and Canada. According to USA Today, travelers can search for international trips up to two weeks long and six months out and Farecast will predict whether fares will go up, down or hold steady over the next week. The new extended service still has limitations, for example a search for San Francisco International (SFO) to London Heathrow (LHR) offers airfares, but doesn’t provide a prediction service despite LHR being a major gateway into Europe, where as SFO to Mexico City now does. 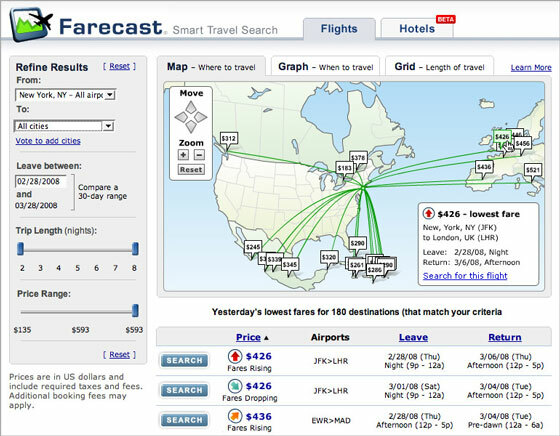 Farecast can be used in a similar fashion to general travel sites such as Expedia as a general airfare and booking service; a search for Melbourne (MLB) to SFO gave similar results to the SFO-LHW search, although despite Farecast providing price comparison links to sites including Expedia, there was no price advantage at all over the other sites. Farecast operates in a highly competitive space, more so since Kayak acquired Sidestep in December. Farecast’s traffic has trended up over the long term, but it is still lagging in third place (see comScore chart below).